This Monday was a public holiday for the observance of Eid al-Adha (Hari Raya Haji), which commemorates Abraham’s (almost) sacrifice of his son, and also marks the end of the Haj. Like Eid al-Fitr, the end of Ramadan, it’s celebrated with big family meals (and, apparently, the sacrifice of a goat) — and in Malaysia, that means it’s time for lemang. I had my first lemang at a pasar Ramadan, but I missed my chance to post about it. It’s glutinous (aka mochi) rice mixed with coconut milk which is stuffed into a banana-leaf-lined bamboo and cooked over an open flame, a sort of natural rice cooker. Lemang seems to be reserved for special occasions; it’s not what you’d call home cooking, and I’ve only seen vendors during the festive seasons. I felt a bit sheepish only buying half a lemang, when most people buy five or ten, but I only have two mouths to feed, after all. We had lemang with the traditional accompaniments of beef rendang (procured at the same vendor) and curry. The richness of the coconut milk plays off the slightly smoky, woody flavor from the bamboo. The most exciting part of lemang is opening up the package. 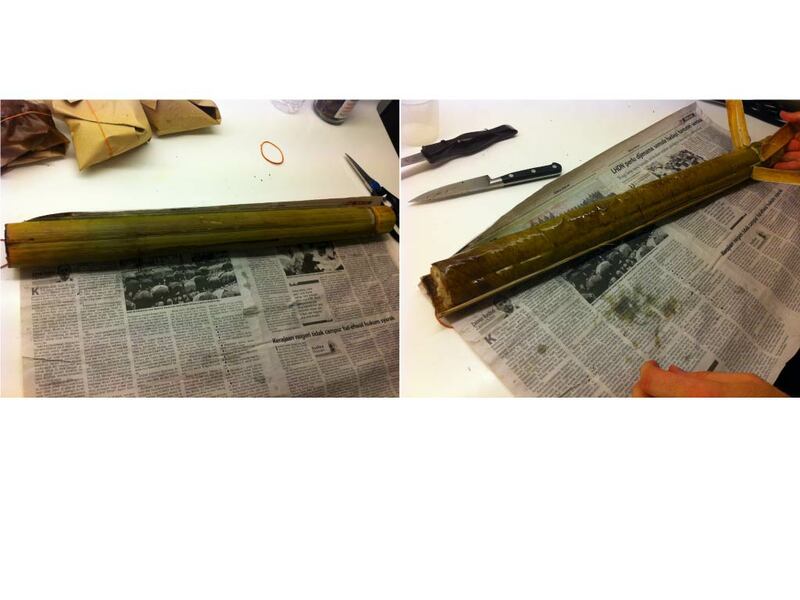 Take a machete, or more likely, a cleaver, and split the bamboo; peel back the woody bits to expose the lemang. I always love a dish that requires big knives; it feels so festive! Lui cha (擂茶), which can be translated as “thunder” or “pounded tea,” is probably one of the few dishes you can order at a hawker stand without fear for your arteries/endocrine system/immortal soul. (OK, it might blow your sodium limit for the day.) It’s a bowl of rice topped with green vegetables, long beans (similar to green beans), tofu, pickled Chinese cabbage, beans, and roasted soy nuts; some versions include tiny dried fish for crunch and saltiness, but it’s optional. The “thunder tea” served on the side is a bowl of green tea blended (well, pounded) with all sorts of herbs so that it’s more of a savory tea soup. 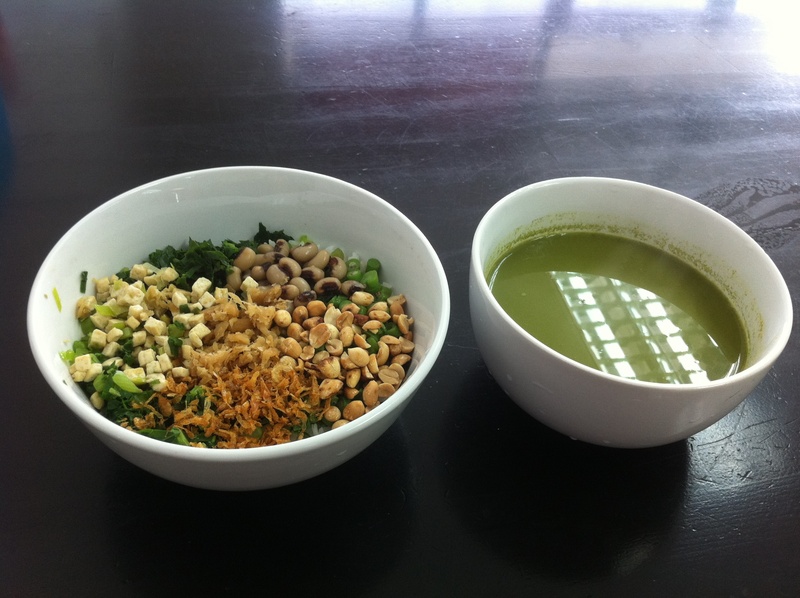 The broth is combined with the rice at the diner’s preference; some people like to pour the whole bowl in, while others dip the rice spoonful by spoonful in the tea. Did you know that Groupon has extended its reach all the way to Malaysia? Their trademark absurdist (and slightly snarky) copy loses something in the translation, but the concept of killer deals doesn’t. We took advantage of one of these for a weekend getaway to The Banjaran Hot Springs Retreat in Ipoh, about two and a half hours north of KL. 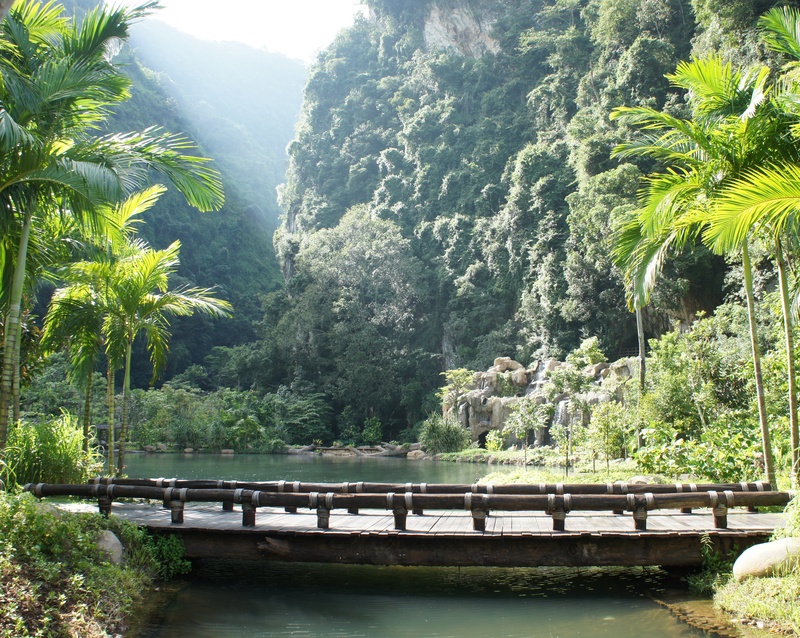 The Banjaran is a resort nestled in the mountains, with natural hot springs and spectacular limestone caves.